I am experiencing this same issue, just upgraded yesterday and immediately the image preview does not load - only on mobile devices though. It works fine on a desktop. The image will show up once you hit post, but users are thinking that it is not working and not posting because the preview thumbnail doesn't show up. Also should note - we aren't using any optimizer or cache plugins. The url is activelyinspiredlife.com, but issue exists on protected member pages. So I am guessing I will need to provide you with login credentials, please advise and let me know how I can send those to you if needed. Thanks. yes @activelyinspired, please send the login details to info[at]gvectors.com email address and let us know. I sent login credentials on Thursday morning last week, have you been able to figure anything out with this issue? Also - to update on the situation, other things we have noticed is that the edit/delete functions of the comments aren't there anymore. 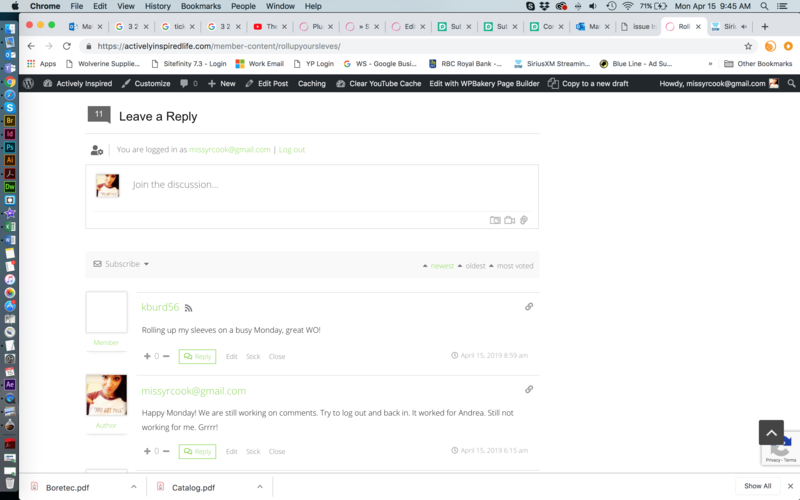 Also it seems to be taking a really long time to post comments, some users can only get the comment to post by hitting refresh on their browser. There has been limited success with the ability to successfully upload images. The preview thumbnail is now loading properly, however the image itself doesn't want to post to the thread. It seems to freeze in the process. Please advise. This is a conflict with other plugins. It doesn't recognize the logged-in users. In our case, it shows the name and email fields even when we've already logged in. The preview thumbnail is now loading properly, however the image itself doesn't want to post to the thread. This also may be caused by the same plugin. Please deactivate the plugins one by one and check after each deactivation to find a problem maker one. I am really at a loss, because it seems to be that no two people are experiencing the same two issues, and the issues seem to be changing all the time. And the issues seem to be different between desktop and mobile use. I have been using two sets of credentials, and when logged in as an Administrator, everything works great on a desktop - on mobile however it does not, it does recognize the login and it still won't show image preview and will not post image for me. When logged in as a subscriber it doesn't seem to ever recognize login credentials. Images don't seem to have any issues when using a desktop computer. The image issue seems to be exclusive to mobile device. I have tried deactivating all the plugins one at a time and that didn't seem to solve any issues. I have attached screen shots of the differences between the desktop and mobile views of the comments when logged in as an Administrator. On the mobile device screenshots, it shows 3 image thumbnails, it let's me select a thumbnail to upload a photo, but once I select photo from library, the image doesn't load - and that is when you see the screenshot with only two image thumbnails. Another issue I am encountering, is that I don't seem to be getting any email notifications for follow-up posts on the thread. I see the admin details you've sent to us. I've already asked the developers, they are going to check it. I'll update the topic asap. Any updates on this situation? The comments are a very important and interactive part of this website so the sooner we can figure out the problem the better. Thank you. This is a very specific case. Our developers are still checking the issue. We noticed that in most cases the issue happens on iPhone devices. The comments are a very important and interactive part of this website so the sooner we can figure out the problem the better. yes, sure we do all our best to solve the issue asap. I'll update the topic once I get some news for you.